If the weather doesn’t interfere — a final blast of winter weather seems to be headed straight for CT — I’ll be on my way to NJ and PA tomorrow, doing some bookhunting with Paul Herman and aiming for the Bordentown NJ Pulp & Paperback show on Saturday. I imagine I will see some of you there. I’ll need a couple of days after that for R&R and for doing my taxes, which somehow haven’t found a way of doing themselves this month. So the not-so-good news is, if all goes as planned, this will be my last post until I surface again sometime next week. I hope you all have something to read while I’m gone! 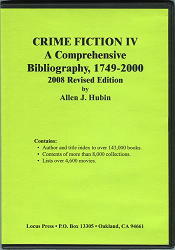 CRIME FICTION IV: REVISED EDITION, 2008, by Allen J. Hubin. The print version is still waiting to be published, but I’ve just received the good news that the new Revised Crime Fiction IV for 2008 is now available on CD-Rom. The author, Allen J. Hubin, has just informed me that he’s received his copies from Bill Contento, and I’m looking forward to obtaining mine from him. The price remains the same, $49.95, and can be ordered from Bill through the Locus Magazine website. (Follow the link.) Bill says he hasn’t had a chance to update the ad, but if you order, which of course I think you should, it is the Revised 2008 Edition that you’ll be getting. Death Noted: KAREN SWEE (1945-2008). 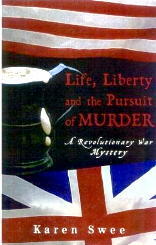 Posted this morning on Reading the Past, my daughter’s historical fiction blog, is some sad news, that of the recent death of Karen Swee, the author of Life, Liberty and the Pursuit of Murder (Bridge Works, 2004), a historical mystery taking place in New Jersey during the American Revolution. The book received high praise from Publishers Weekly and Booklist, and more in the series were expected, but apparently this is not to be. Go first to Reading the Past for more, then to her obituary in the Newark Star-Ledger. Review: VICTORIA LAURIE – Crime Seen. VICTORIA LAURIE – Crime Seen. Obsidian; paperback original. 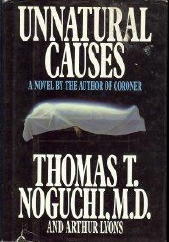 First printing, September 2007. … in which M. J. Holliday and her partner Gilley are, as advertised, ghostbusters who also come across mysteries to solve in the course of their daily routine. I suppose I sound slightly dismissive there, and if I did, I probably meant it, just a little. Psychic detectives have been around a long time — since the days of Weird Tales and Seabury Quinn’s detective Jules de Grandin, and probably even before that. And another fact is — or is this just my opinion? — solving crimes by psychic means takes all of the fun out of solving mystery puzzlers. Well, OK. It’s just my opinion. What Abby Cooper has the ability to do is to wave her hand over her FBI boy friend’s “closed case” files, get pictures from them in her mind and give him hints as to who the culprit is or how he got away with it. Or she can accompany her PI girl friend to interview suspects and give her a kick under the table when she know the suspect is lying. In Crime Seen she helps Dutch — that’s her boy friend — catch Dutch’s new partner’s former partner’s killer. Or rather, what she’s asked to do is to help prevent the confessed killer from getting parole. In doing so, she risks her life at least once, when a enemy Hummer runs her and her PI friend Candice off the road into a deep ravine. And she doesn’t tell Dutch. There are some issues involved. Go figure. The characters are otherwise pleasant enough, and the psychic abilities just unreliable enough, that the book is easy and — in spite of my statement above — fun to read. Just don’t take it too seriously, and my own personal pre-judgments aside, you’ll see why this is a popular series that’s doing well. Death Noted: ARTHUR LYONS (1946-2008). 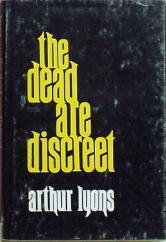 The news of mystery writer Arthur Lyons’s unexpected death appeared quickly on the mystery blogs today. First to report was Jiro Kimura’s The Gumshoe Site, followed up soon after by Jeff Pierce at The Rap Sheet, with a long and personal homage to Mr. Lyons. The latter died on March 21st of complications from pneumonia and a stroke; he was only 62. Here’s a complete list of Arthur Lyons’s work, at least in printed form. 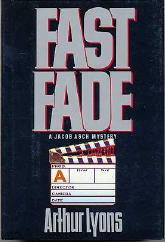 Taken and expanded upon from Crime Fiction IV, by Allen J. Hubin, I’ve been able to find covers from all but one of the Jacob Asch books. I apologize that it’s a mixture of hardcovers and paperbacks, nor have I made note of the various reprint editions in which his books have appeared. 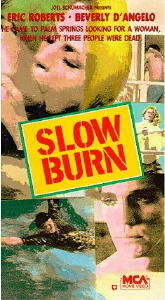 Slow Burn, based on Castles Burning. Starring Eric Roberts as Jacob Asch. [UPDATE] 03-26-08. 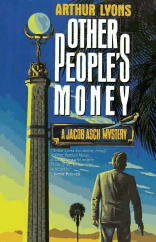 For an insightful essay by Jeff Pierce on both Lyons and Jacob Asch, may I suggest a return visit to The Rap Sheet. It was written in 1981 or thereabouts, but its age does not diminish the timeliness of this followup post in any way whatsoever. Any assistance toward answering any of these questions would be greatly appreciated. Leave a comment or reply to me directly, and I’ll pass the word along to those who are asking. “I have been doing some research on the elusive Dorothy Feilding/A. Fielding and have discovered that papers relating to her are held in the collection of papers of UK literary agent A.P. Watt which are held in the library of the University of South Carolina. “I asked the library but they are not willing to look themselves!! A pity as there might be vital clues about her. They suggested using a professional searcher, but I don’t want to pay up front for possibly a zero result – plus paying anyone might be difficult as I do not use credit cards. “I believe I mentioned previously that I am working on an addition to my Digest Index which will index the contents of the anthologies and collections therein. I have everything I need except for two books that are eluding me. I am writing to you in the hope that you can help me with these, or network me to someone who can. “The hardest book to find is the Bonded Mystery edition of This Is Mr. Fortune by H. C. Bailey. The only documentation on this book is the listing in Kevin Hancer’s Price Guide. No library on the web has it and no one ever seems to be selling one. “The most frustrating book is the Bestseller Library edition of The Mysterious Mr. Quin by Agatha Christie. Several libraries on the World Catalog have it but my attempts to get information through inter-library loan have been frustrated by the response that the book apparently does not have a contents page. It would seem I need to convince a friendly librarian to actually look at it and jot down the contents for me. I am optimistic on this score by the discovery that one of the libraries that has a copy is Bowling Green University. “So, my first question is: do you know anyone, or can you network me to anyone, connected to Bowling Green University or their Popular Culture collection who might be willing to accommodate my request for info on the Christie book? “The second question is: would you be willing to mention my quest for the contents of these two books in one of your blog entries, in the hope of drawing the info out of some collector? That edition of the book by H. C. Bailey may not exist. My copy of Hancer’s guide isn’t handy at the moment, but a quick check reveals that Graham Holroyd does not include it in his. Neither fact, that it’s in one and not the other, is entirely convincing. It would be nice to know for sure. 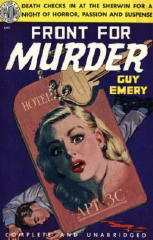 Front for Murder (Macrae-Smith, 1947, hc) [San Francisco, CA] Boardman pb, 1948. (1) One tentative offer to do the library research has been tendered so far, but if you live in that part of the country and are willing to do the required digging into some archives, please check to see if things have worked out as we hope they have. Steve: Please pass this on to Ken Johnson or post it on your blog. I can�t speak to the Christie Bestseller title, but no library or bookseller has the Bonded This is Mr. Fortune title because I�m virtually certain that it does not exist. Hancer is not the only reference that lists it � R. Reginald and M.R. Burgess also list it in Cumulative Paperback Index 1939-1959, Gale Research Co., Detroit 1973 page 9. 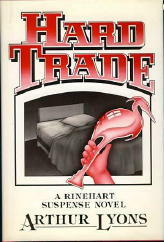 It is well-known that Reginald and Burgess (actually only Reginald � Burgess is a fictitious name) salted his compilation with a number of books that do not exist in order to nail plagiarists, and Hancer did indeed plagiarize and was successfully sued by Reginald. Since I�m familiar with the Bonded series (having once had them all and now having about 90% of them — some are digest size, others are pb size), I�m virtually certain the Fortune title is one of Reginald�s fake listings. H.C. Bailey�s The Twittering Bird Mystery (Bonded No. 8 ) does exist, however. Hope this helps. Dan Roberts. (3) Nothing yet on Guy Emery. Actually I disagree. The intro to Reginald’s Cumulative Paperback Index mentions the check entries and states that none of them involve real authors, which is definitely the case for all the ones so far known. While Reginald lists both the Susan Wells ((Footsteps in the Air)) and the H. C. Bailey (which Hancer identifies as #s 15 and 16) he does not supply the book numbers, so Hancer could not have cribbed them from him. It is also my understanding that all of Reginald’s check entries were purged from Hancer’s later editions. I looked again at my copy of Bonded Mystery #13. The inside back cover has an ad for both the Wells and Bailey books, with black and white drawings of the covers, stating that they will both be on sale next month. Since I cannot find any other confirmation of their existence, they were probably never issued. Hancer may very well have assigned them book numbers as a way of generating his own check entries, which he seems to have done a lot of after Reginald sued him for repeating his check entries. I will have to update the entry in my Digest Index. If I hadn’t gone looking for the contents I might never have spotted this. Please thank Dan for his comments; I would appreciate any other comments he might have that would improve my index. I still have a lot to learn. 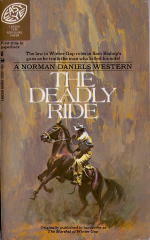 Western Review: NORMAN DANIELS – The Deadly Ride. NORMAN DANIELS – The Deadly Ride. Lancer; paperback reprint, no date stated but stated elsewhere to be 1968. Original title: The Marshal of Winter Gap, as by Peter Grady (Avalon Books, hc, 1962); paperback reprint: Airmont Books, 1963. I�m not too sure of the date for the hardcover edition, which I found online in several places, since the copyright date given in this Lancer edition is 1963. A trifling matter, I suppose, and I guess it ought to bother me more than it does. Nor have I done much research into the western fiction that Norman Daniels wrote. I found two more he did as by Peter Grady, but his overall output � hundreds of books, mostly mysteries, but romances too, including gothics as by Dorothy Daniels � is too large for me to start sorting out which is which right now. Suffice it to say, I’m sure, Daniels could write anything that someone paid him to do, beginning in the era of the pulp magazines, and for the most part he made it come it out right and professionally done. This western at hand is a perfect example of that. It�s slight and in the beginning a not very promising story of a rancher who used to be a gunman, emphasis on the �used to be,� especially now that he has a nine-year-old son. But when his wife is killed by a stray bullet in the lawless town of Winter Gap, he�s sorely tempted to revert to his old ways, which doesn�t quite do. Prodded on, though, by the urging of Louise Amister, whose father was the last marshal the town ever had, what he does do is appoint himself town marshal, daring any of the rougher elements in town to tell him no. Characterization is slim � I�ve outlined about 80% of it already � but there�s just enough here, along with a surprise or two, and a semi-sappy, soapy sort of ending, to make for a couple of hours of reading and a story that�s surprisingly hard to put down. Review: GEORGE MARTON AND TIBOR M�RAY – Catch Me a Spy. CATCH ME A SPY – George Marton and Tibor M�ray. 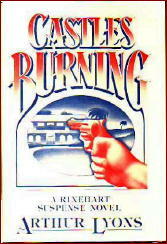 Popular Library; paperback reprint, no date stated, but stated elsewhere to be 1971. Hardcover edition: W. H. Allen, UK, hc, 1971; Harper & Row, US, hc,1969. 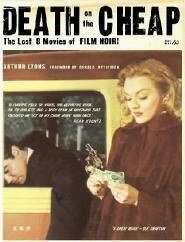 I reviewed the movie based on this book way back in May of last year, then followed it up soon afterward with a short profile of the first of its two authors, George Marton. I mentioned then that it took me by surprise that the story was played for fun, so I wasn�t sure if the book was going to be a comedy as well. I played it cautiously as I read, waiting to see what would happen, and � I�ll tell you in a minute. Here�s a short recap of the story itself. A young and rather naive English girl named Jennifer, the niece of a famous chemist, is wooed and romanced by a chap named Fenton who sweeps her off her feet and takes her off to a honeymoon in � Bulgaria. Where on their wedding night, before their marriage is consummated, he is whisked off to a Moscow prison. Returning eventually � and disconsolately � to London, Jennifer decides on a plan: to find a spy on the other side operating in England whom she can capture and use in a swap to gain her husband back. So here is where the humor comes in. I did say that Jennifer is naive, didn�t I? So unsophisticated in the world that she does not even know that Hungary does not have a navy, much less a naval attache. Is there a chance in the world that such a charming young woman � played by Marl�ne Jobert in the movie � would have a chance in the world at completing such a mission? It is but to laugh, although gently. Whereas in the movie the comedy is much more physical, although again (if this makes sense) in a gentle way. The spy that Jennifer does meet � played by Kirk Douglas in the movie � also appears much earlier on in the film, a good choice that, as it gets the major players face to face quite a bit earlier. The endings are also not quite the same, but at least they were built on the same basic premise, which of course is one that I cannot reveal. At only 174 pages of medium-sized type, the book is too slender to have even been a major player in the world of fictional spy fiction, mildly complex and no more. A pleasant diversion, that�s all, and no less. Plus � and I’m sure it’s a huge bonus in some collectors� minds � a really spiffy cover by Robert McGinnis, which I imagine you�ve guessed � and admired � already. Addenda to CRIME FICTION IV – Misc. Authors from Part 25. I spent part of this afternoon annotating the following authors’ entries in Part 25 of the online Addenda to Crime Fiction IV, by Allen J. Hubin. Looking over the list after I was done, the only connecting feature these authors have in common is that they are in this blog post, and nothing else at all. LEITE, GEORGE THURSTON. 1920-1985. 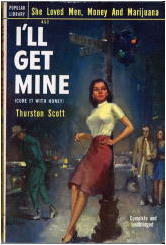 Joint pseudonym with Jody Scott, 1923-2007: Scott Thurston, qq.v. 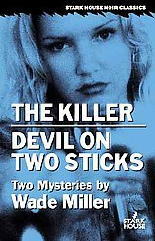 Under this pen name the co-author of one crime novel included in the (Revised) Crime Fiction IV. Owner of Daliel�s Bookstore in Berkeley, editor of Circle Magazine, and a long-time publisher. RICH, A(RTHUR) T. [Show byline thus.] Author of one detective novel included in the (Revised) Crime Fiction IV. See below. The Curate Finds the Corpse. Bear Hudson, UK, pb, 1945. Setting: England. SCOTT, AMANDA. Add as a new author entry. Pseudonym of Lynne Scott-Drennan, 1944- , q.v. Under this pen name, the author of some 40 romance novels, many of them Regencies. The titles below appear to have at least marginal crime content. -Dangerous Angels. Pinnacle, 1997. Setting: England, 1829. SC: Lady Letitia Deverill, in a non-leading role. SCOTT, JODY. 1923-2007. Add year of death. Full name: Jody Hugelot Scott Wood. Born Joann Margaret Huguelet. �Mr. Scott came later closely followed by Mr. Wood.� Joint pseudonym with George Thurston Leite: Thurston Scott, qq.v. Under her own name, the author of two sf/fantasy novels, Passing for Human and I, Vampire. SCOTT, THURSTON. Joint pseudonym of George Thurston Leite & Jody Scott, 1923-2007, qq.v. Correct full name of the latter to Jody Huguelet Scott Wood, q.v., and add year of death. Under this pen name the author of one crime novel included in the (Revised) Crime Fiction IV. See below. SCOTT-DRENNAN, LYNNE. 1944- . Pseudonym: Amanda Scott, q.v. 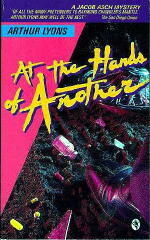 Born and currently living in California, prolific writer of romance fiction, under both her own name and her pen name. WOOD, JODY HUGUELET SCOTT. See Jody Scott. Review: WADE MILLER – Killer’s Choice (aka Devil on Two Sticks). WADE MILLER – Killer�s Choice. 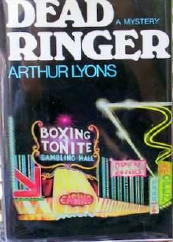 Signet 771; paperback reprint. 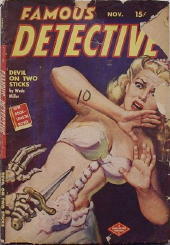 First printing, February 1950. Second printing, Signet 1235, 1955. Fourth printing, 1961. 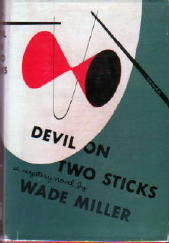 Originally published as Devil on Two Sticks by Farrar, Straus & Co., Inc. Appeared earlier in Famous Detective magazine, November 1949. Trade paperback: Stark House, June 2008 (paired with The Killer, Gold Medal, 1951). 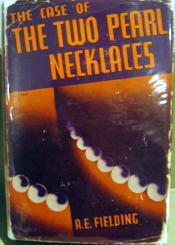 If you�d like to read more about the writing pair of Robert Wade and Bill Miller, then I can send you to no better place than the original Mystery*File website, where you can find an overview of their career, many reviews of their work, a partial bibliography, and an interview with Mr. Wade conducted by Ed Lynskey back in 2004. Killer�s Choice (or Devil on Two Sticks, if you prefer) is not one of Wade Miller�s stories of private eye Max Thursday, which I can highly recommend to you, if you are a private eye fan, and even if you�re not. It�s instead a tough, hard-as-nails story of a mobster named Steve Beck, or rather a head mobster�s right hand man, or enforcer, if you will. The setting is San Diego, and when word gets to Beck�s boss, a fellow by the name of Pat Garland, that the state Attorney General�s office in Sacramento has a direct line into his operations, it�s Beck�s job to find the insider and plug the leak, and fast. It�s like a detective story in reverse, with a list of suspects from which to pick the Good Guy, not the other way around. Complicating matters is that Beck is falling in love with the daughter of one of his possible choices, a lawyer by the name of Everett. Marcy is slim, young and not as sophisticated as she thinks she is, and a far cry from Beck�s usual taste in women. One more problem: Marcy seems to favor one of Beck�s other suspects more than she does him. Jealousy is an ugly monster. There is at least one additional surprise in store for the reader, which I won�t even begin to hint at, other than what I’ve just said. Surprisingly, though, and not the surprise I just alluded to, is that there is not a lot of action in this novel of the rackets. A lot of talk � a lot of threats, some subtle, some not � most of it very intelligent, and you have to read every word behind what everyone says, if you know what I mean. I was reminded more of Dashiell Hammett more than I was Raymond Chandler while reading Killer�s Choice. Robert Wade mentions both as influences in the Lynskey interview, along with Alfred Hitchcock, and I can see the latter as well. The book would have made a terrific movie back around 1950, and in the right hands, it still would today. But I mention Hammett in the following sense. We follow the story’s progress through Steve Beck, although he does not tell the story himself. We know what he says and what we sees, but we do not always know what he�s thinking, and for a hoodlum, he thinks a lot. And it also turns out that he�s not quite as capable as he has always led himself to believe, and it comes as quite a shock when he discovers this � especially to him. 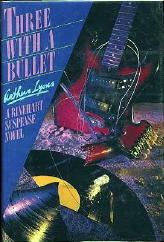 As I hope I’ve made clear, this is not your usual Mike Hammer kind of yarn, to pick a rather obvious author to use in comparison, but at the time the books of both of them came out, I think Wade Miller�s books did respectably well in the competition, and deservedly so. It’s good to see this one coming out again, there’s no doubt about that. You are currently browsing the weblog archives for March, 2008.